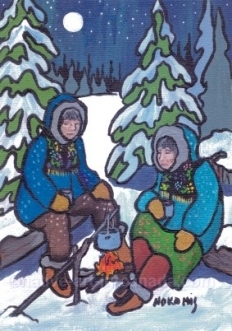 "Nice Cup of Tea" is a painting by the Ojibwa artist Nokomis. It wasn't just the British who enjoyed a nice cup of tea. Even in the bush north of Lake Superior miles from any sort of store, folks in the know could enjoy a pot of hot tea. Earl Grey and Orange Pekoe teas were available at the store, but that establishment was always too far away and that kind of tea was expensive. We Ojibwa were more likely to make our own tea because it was free and close at hand. Favourites teas in my family were made from mint, kinnickinick and oswego leaves. I think gardeners may know the latter plant as monarda. My mother also made a tea from a low growing plant with smooth eaves and white flowers. I can't remember the name she used for it but I think you English speakers may call it Labrador tea. The old couple in this picture have decided to have a nice cup of spruce tea before trudging the rest of the way home on this cold winter night. It would have been the same spruce tea that was given to Champlain and his men to rescue them from the thralls of scurvy. If you want to try it, simply pull off a hand full of spruce needles and let them steep in a pot of boiling water...but be forewarned that it's an acquired taste (like olives).